Issue 1 of SRSP-371.0 has been developed to reflect Innovation, Science, and Economic Development Canada's spectrum utilization policy described in Spectrum Utilization Policy SP 70 GHz, Decisions on the Frequency Bands 71‑76 GHz, 81‑86 GHz and 92‑95 GHz . This Standard Radio System Plan (SRSP) outlines the minimum technical requirements for the efficient use of the frequency bands 71‑76 GHz and 81‑86 GHz by point‑to‑point digital line‑of‑sight radio systems in the fixed service. This SRSP is intended to be employed in the design and specification of radio systems and equipment. It specifies equipment characteristics relating to efficient spectrum usage only, and is not to be regarded as a comprehensive specification for equipment design and/or selection. Revisions will be made to this SRSP as required. As described in Spectrum Utilization Policy SP 70 GHz, Decisions on the Frequency Bands 71-76 GHz, 81-86 GHz and 92-95 GHz , the interim link‑specific licensing process shall remain in force until such time that a formal area‑based spectrum licensing process is established. More specifically, see section 5 of SP 70 GHz for the licensing policy decisions in these bands. Systems licensed under the interim licensing process must be coordinated domestically under the procedures applicable to radiocommunication station licences, as described in Radio Standards Procedure RSP-113, Application Procedures for Planned Radio Stations Above 960 MHz in the Fixed Service . The domestic coordination requirements in section 7 of this standard will only apply once the formal, area‑based, spectrum licensing process is established. The international coordination requirements described in section 9 apply to all licensed systems (including those under the interim licensing process). With respect to the resolution of interference conflicts between radio systems, Innovation, Science and Economic Development Canada (hereinafter referred to as the Department), will only become involved for systems licensed under the interim licensing process. In this scenario, the Department must be advised when a potential conflict between radio systems cannot be resolved by the parties involved. After consultation with these parties, the Department will determine the modifications and schedule of modifications required to resolve the conflict. However, once the formal area‑based, spectrum licensing process is established, the licensees will be required to resolve interference conflicts between radio systems. The Department expects that the resolution of interference conflicts be achieved through good faith discussions and mutual agreements between affected parties. Radio systems conforming to these technical requirements will be given priority in licensing over other non‑standard radio systems operating in these bands. The arrangements for non‑standard systems are outlined in SP Gen, General Information Related to Spectrum Utilization and Radio Systems Policies . Even though a radio system may be compliant with the requirements of this SRSP, modifications may be required to the system whenever there is harmful interference.Footnote 1 These modifications may include changes to the operating frequency channel, the transmitter and/or receiver antenna deployment characteristics (i.e. gain, backlobe and sidelobe discrimination, polarization, elevation angle, etc. ), and the use of a receiver with improved selectivity characteristics. It should be noted that the fixed service shares this band with other services in accordance with the Canadian Table of Frequency Allocations. Some technical requirements in this standard are specified in accordance with the selection of other specific technical parameters used in the design of a radio system. Annex C provides a summary of these dependencies between technical requirements and parameters. Current issues of the following documents are applicable. Unless otherwise stated, they are available on the Spectrum Management and Telecommunications Official publications page. Limits of Human Exposure to Radiofrequency Electromagnetic Energy in the Frequency Range from 3 kHz to 300 GHz , available on Health Canada's website. 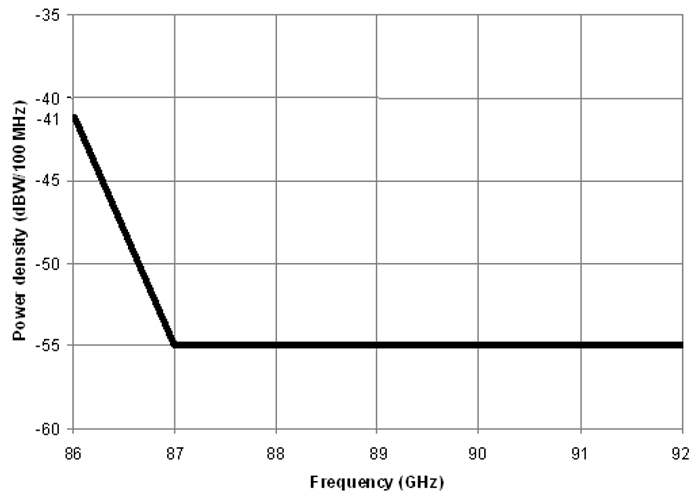 The bands 71-76 GHz and 81-86 GHz are divided into 19 paired 250 MHz frequency channels, as shown in figure 1 and table 1. The frequency channels are symmetrically paired with a common transmit/receive separation of 10 GHz to facilitate frequency division duplex (FDD) radio systems. Time division duplex (TDD) systems may operate in any channel within the bands 74375 to 75875 MHz and 84375 to 85875 MHz, as shown in figure 1 and table 1. When wider channels are required, consecutive 250 MHz channels may be aggregated into FDD or TDD channels, as defined in table 2. Provided the spectral efficiency requirement described in section 4.4 is maintained, channel aggregation, up to a maximum of 18 adjacent 250 MHz channels, is permitted for FDD systems and up to a maximum of 3 adjacent 250 MHz channels is permitted for TDD systems. annex B provides a graph summarizing the channel aggregation plan. Fixed radio systems shall be assigned first in the 71-74 GHz and 81-84 GHz range. The frequency assignments within the 74-76 GHz and 84-86 GHz range may be employed only if all other channels are unavailable. 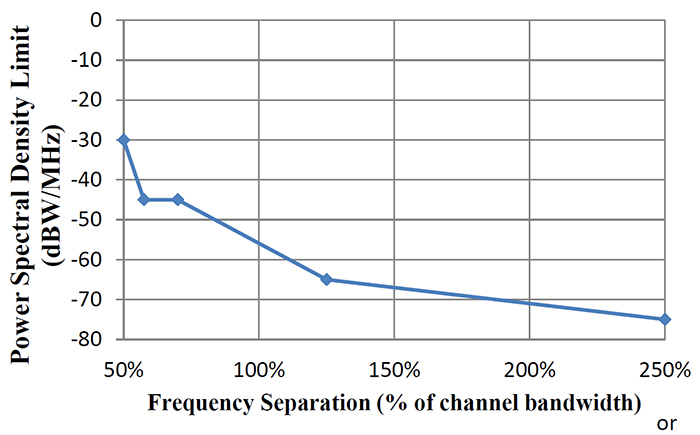 This figure illustrates the band plan and associated usage for the bands 71-76 and 81-86 GHz. The channel centre frequencies are also described in table 1 of section 4.1. The frequency ranges 71.125 to 74.375 GHz and 81.125 to 84.375 GHz provide for thirteen pairs of 250 MHz channels (A1/A1′ to A13/A13′) for systems employing FDD. The frequency ranges 74.375 to 75.875 GHz and 84.375 to 85.875 GHz provide for 6 pairs of 250 MHz channels (A14/A14′ to A19/A19′) for systems employing either FDD or TDD. The frequencies assigned to a main route should be reused on the branching and spur routes where possible. In order to obtain sufficient antenna discrimination at the branch‑off angle, the siting of repeater stations should be planned with this requirement in mind. Systems must be designed so that any closed loop network contains an even number of hops. Listed below are the spectral efficiency requirements for radio systems using an RF channel bandwidth up to 2000 MHz and for those exceeding 2000 MHz. Specified also are requirements for radio systems using modulation or adaptive error‑correction coding. Digital systems shall achieve a minimum spectral efficiency of 1 bit/s/Hz within the allocated Radio Frequency (RF) channel bandwidth and on a single polarization. Digital systems shall achieve a minimum spectral efficiency of 0.7 bit/s/Hz within the allocated RF channel bandwidth and on a single polarization. In the case of systems using adaptive modulation or adaptive error‑correction coding to maintain link availability during deep fading conditions, the spectral efficiency level may be temporarily lowered for a short period of time, provided that the link is designed to meet the minimum spectral efficiency requirements specified in the provisions above. Listed below are the specific transmitter characteristics for radio systems that use an RF channel bandwidth less than or equal to 2000 MHz. The transmitter power into the antenna shall not exceed 0 dBW. The transmitter power spectral density (PSD) delivered to the antenna input shall not exceed −15 dBW/MHz. The transmitted frequency shall be maintained within ±0.015% of the assigned frequency. For transmitters employing an antenna having a gain of less than 55 dBi, the maximum e.i.r.p. limit of 55 dBW must be reduced by 1 dB for each dB of gain below 55 dBi, and by a further 2 dB for each dB of gain below 45 dBi. This requirement is further described by the equations in table 3 below. In the case of systems using automatic transmit power control (ATPC) to maintain link availability during deep fading conditions, the maximum transmitter power at the antenna port may be temporarily increased by a value corresponding to the ATPC range, up to a maximum of 5 dBW. However, the maximum e.i.r.p. limits specified in section 5.1.3 supersede this stipulation. As a result, systems employing ATPC shall in no case or time have a transmitter power exceeding +5 dBW nor a maximum e.i.r.p. exceeding +55 dBW. The unwanted emissions shall be attenuated to meet the power spectral density (PSD) limits specified in table 4 and figure 2. The PSD limits are specified at frequencies removed from the assigned channel center frequency as a percentage of the channel bandwidth, and shall be applied at the antenna input. The channel bandwidth value to be applied for this requirement is based on the channel bandwidths provided in section 4 of this standard. In the case of systems employing ATPC, the PSD limits specified in table 4 and figure 2 may temporarily be exceeded, during deep fading conditions, by a value corresponding to the ATPC range, up to the maximum limit permitted in section 5.1.4. Line graph: Shows the unwanted emission limits in dBW/MHz. The y‑axis measures the power spectral density limit in dBW/MHz from −80 to 0. The x‑axis plots the frequency separation from the assigned channel center frequency as a percentage of the channel bandwidth from 50 to 250. There is only one data line. The line ranges from −75 to −30 on the y‑axis. Several data points for the line are shown in table 4, with a straight line interconnecting each adjacent point. The measured power spectral density of the transmitter must be within these limits. * The 250% value is applied for a channel bandwidth that is less than or equal to 500 MHz. For a bandwidth greater than 500 MHz, the 150%+500 MHz value is applied. The power spectral density, delivered to the antenna input, outside the edges of the bands 71-76 GHz and 81-86 GHz shall be limited to a maximum of −55 dBW/MHz. Additionally, emissions into the band 86-92 GHz are furthermore limited. The power spectral density, delivered to the antenna input, shall be limited to a maximum of −41 dBW/100 MHz at 86 GHz and reducing proportionally to −55 dBW/100 MHz at and beyond 87 GHz, as described in figure 3. In frequency ranges and conditions where the requirements of section 5.1.5 are also applicable, the more stringent limits shall be applied. Line graph: Shows the out‑of‑band unwanted emission limits in dBW/100 MHz, in the 86 to 92 GHz frequency range. The y‑axis measures the power spectral density limit in dBW/100 MHz from −60 to −35. The x‑axis plots the frequency in GHz from 86 to 92. There is only one data line. The line ranges from −55 to −41 on the y‑axis. The line starts at a power density of −41 dBW/100 MHz at a frequency of 86 GHz, shift down linearly to −55 dBW/100 MHz at a frequency of 87 GHz, and finally remains straight at −55 dBW/100 MHz up to a frequency of 92 GHz. The measured power spectral density of the transmitter must be within these limits. Listed below are the specific transmitter characteristics for radio systems that use an RF channel bandwidth greater than to 2000 MHz. The transmitter power into the antenna shall not exceed −10 dBW. The transmitter power spectral density (PSD) delivered to the antenna input shall not exceed −46.5 dBW/MHz. The maximum equivalent isotropically radiated power (e.i.r.p.) from the antenna must not, in any case, exceed +45 dBW per RF channel. For transmitters employing an antenna having a gain less than 55 dBi, the maximum e.i.r.p. limit of 45 dBW must be reduced by 1 dB for each dB of gain below 55 dBi, and by a further 2 dB for each dB of gain below 45 dBi. This requirement is further described by the equations in table 5 below. In the case of systems using automatic transmit power control (ATPC) to maintain link availability during deep fading conditions, the maximum transmitter power at the antenna port may be temporarily increased by a value corresponding to the ATPC range, up to a maximum of −5 dBW. However, the maximum e.i.r.p. limits specified in section 5.2.3 supersede this stipulation. As a result, systems employing ATPC shall in no case or time have a transmitter power exceeding −5 dBW nor maximum e.i.r.p. exceeding +45 dBW. Radio systems operating with an RF channel bandwidth greater than 2000 MHz shall follow the unwanted emissions requirements specified in section 5.1.5. Listed below are the specific antenna characteristics for radio systems that use an RF channel bandwidth less than or equal to 2000 MHz. The minimum antenna gain shall be 38 dBi. An antenna gain less than 55 dBi (but greater than or equal to 38 dBi) is permitted only with a proportional reduction in maximum authorized e.i.r.p., as per section 5.1.3. The co‑polarized radiation pattern envelope in the horizontal plane of the antenna must remain within Envelope A shown in figure 4 and table 6, for both vertical and horizontal polarizations. 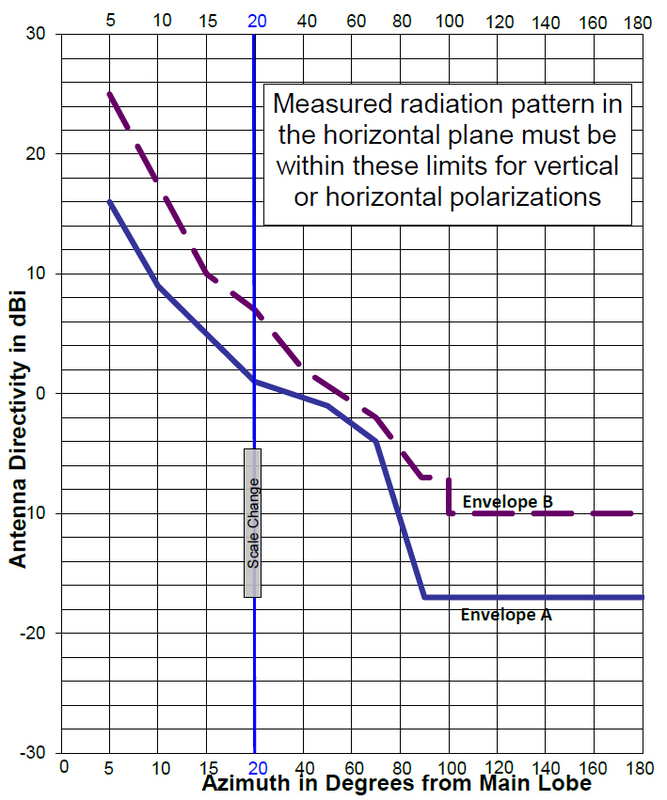 Deployments of radio systems with a co-polarized radiation pattern envelope which remains within Envelope B shown in figure 4 and table 6, for both vertical and horizontal polarizations, are permitted only if the antenna is deployed at a height of less than 15m above ground level. The values for the radiation pattern envelopes shown in figure 4 and table 6 are specified as off‑axis antenna gain in units of dBi, as opposed to dBs of attenuation from the main lobe gain. In order to convert the pattern values to attenuation from the main lobe, the antenna main beam gain in dBi can be subtracted from the off‑axis dBi values of the applicable envelope. An antenna gain of less than 55 dBi (but greater than or equal to 38 dBi) is permitted only with a proportional reduction in maximum authorized e.i.r.p., as per section 5.2.3. The co‑polarized radiation pattern envelope in the horizontal plane of the antenna must remain within Envelope A for both vertical and horizontal polarizations. The deployment of a radio system using an RF channel bandwidth greater than 2000 MHz and an antenna radio pattern remaining within Envelope B is not permitted. Line graph: Shows the antenna radiation pattern limits in dBi for azimuth separations from the main lobe between 0 and 180 degrees. The y‑axis measures antenna directivity in dBi from −30 to 30. The x‑axis plots azimuth in degrees from main lobe from 0 to 180. There are two data lines. The data line for envelope A ranges from −17 to 16 on the y‑axis. The data line for envelope B ranges from −10 to 25 on the y‑axis. There is a scale change indicator at the 20 mark on the x‑axis. Several data points for the lines are shown in table 6. The measured radiation pattern in the horizontal plane must be within these limits for vertical or horizontal polarizations. As outlined in section 2.2, the domestic coordination requirements in section 7 of this standard shall not apply to systems licensed under the interim licensing process described in SP 70 GHz, until the licensing process for these bands has been established. Licensees are responsible for coordinating directly with other licensees. To reduce the potential for interference, licensees are required to register their stations by entering and accurately maintaining up‑to‑date site‑specific data, as well as technical, operational and contact information in a database specified by the Department. The interference protection date is based on the date of registration of the station. The Department requires all licensees to successfully complete frequency coordination prior to operating a new system or modifying an existing system. A licensee shall notify other licensed operators offering service in the same area and in neighbouring areas, at least six weeks prior to putting a station in service or making modifications to an existing station. Licensees are expected to cooperate and jointly resolve issues to ensure equitable access to the spectrum by all operators. Licensees shall not begin operation of their systems until successful completion of both registration and coordination. Interference may still occur, even with the favorable propagation characteristics of these bands. However, the Department will not be directly involved in frequency assignment, station coordination, or the resolution of interference issues between fixed service licensees, even though the technical specifications of this SRSP are met. The resolution of potential interference conflicts should be achieved through good faith discussions and mutual agreement between the affected parties. More information on interference reduction techniques can be found in Appendix A of Radiocommunication Information Circular RIC‑67, Information for Operators of Digitally Modulated Radio Systems in Licence‑Exempt Radio Frequency Bands . The following coordination procedures are intended to be used between two licensees in the absence of another mutually agreed-upon standard to govern coordination of any proposed or modified transmitter. Licensees who propose transmitters that would normally trigger the current procedure, but who can mutually agree to an alternate coordination procedure, are not bound by this process. A copy of such mutual agreement must be kept by the licensee and made available to the Department upon request. If a licence is transferred, the sharing agreement(s) developed between the former licensees shall remain in effect until superseded by a new agreement between the licensees. When a licensee seeks to install or modify facilities, successful completion of applicable coordination is required prior to activation. Coordination is required whenever a proposed transmitting station coordination footprint encompasses existing or previously notified receiving stations of another licensee. The coordination footprint extends to the distances shown in figures 5 and 6 below.Footnote 3 Radio systems operating with an antenna that meets the radiation pattern of Envelope A in section 6 shall follow the coordination footprint specified in figure 5, while those meeting the radio pattern of Envelope B shall follow the coordination footprint specified in figure 6. This figure shows the co‑channel frequency coordination footprint for point‑to‑point systems operating with an antenna meeting envelope A. Coordination is required with all stations within a distance of 50 km where the off‑axis angle at the new station's boresite is less than or equal to 5 degrees. 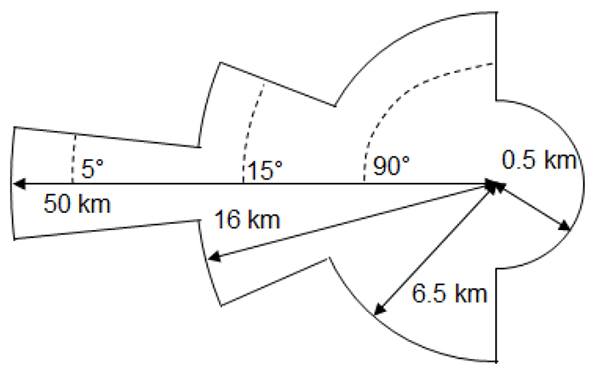 Coordination is required to a distance of 16 km where the off‑axis angle is greater than 5 degrees and less than or equal to 15 degrees. Coordination is required to a distance of 6.5 km where the off‑axis angle is greater than 15 degrees and less than or equal to 90 degrees. At off‑axis angles greater than 90 degrees, coordination is required within a distance of 0.5 km. This figure shows the co‑channel frequency coordination footprint for point‑to‑point systems operating with an antenna meeting envelope B. Coordination is required with all stations within a distance of 50 km where the off‑axis angle at the new station's boresite is less than or equal to 5 degrees. 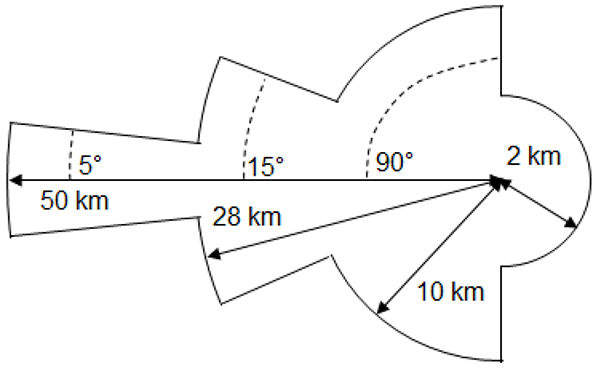 Coordination is required to a distance of 28 km where the off‑axis angle is greater than 5 degrees and less than or equal to 15 degrees. Coordination is required to a distance of 10 km where the off‑axis angle is greater than 15 degrees and less than or equal to 90 degrees. At off‑axis angles greater than 90 degrees, coordination is required within a distance of 2 km. If a proposed station triggers the coordination process, the licensee must notify all licensees concerned. The said notice shall include the applicant's interference analysis and all data required for the recipients to perform an interference analysis (see annex A for suggested parameters). It is recommended that field tests be performed prior to commencement of operation of a radio system to determine whether interference caused by building reflections or other frequency sources, which was not anticipated during the interference calculations,Footnote 4 is detected at the proposed site while looking along the proposed azimuth. Upon receipt of a coordination notice, a recipient shall have a maximum of 14 calendar days to submit an interference objection. This objection shall include the calculation details of all potential cases of unacceptable interference into and from facilities proposed in the notice. Failure to respond to a coordination notice within that time frame shall imply that the recipient has no interference objection(s) to the facilities proposed in the notice. It may be necessary at times for licensees to deploy systems even more rapidly than the timeframe provided for in the notice and response procedure contained in this process. To do so, licensees shall be permitted to activate systems immediately once receipt of the coordination notice has been confirmed, provided that the notice clearly identifies a licensee's intent to do so. The notice must also include the activation date, the time, and a 24‑hour contact telephone number for notification, should an interference case occur. Licensees activating facilities under this expedited procedure will be held entirely responsible for avoiding and/or resolving any cases of interference created by such activation. They will be required to cease transmission immediately upon receiving verbal and/or written notice from another licensee that interference has occurred. This requirement will remain in effect until the standard 14 calendar day coordination period has expired. Upon successful resolution of all interference objections, the licensee will have 180 calendar days to construct and commence operation; otherwise, coordination must be re‑initiated, as per section 7.1. Within two business days of construction and initiation of operation of coordinated facilities, a licensee will notify all licensees who received a coordination notice that facilities contained in that notice are in permanent operation. Upon decommission of previously operational facilities, a licensee shall notify all other affected parties that a particular facility will been permanently taken out of service within two business days of decommission. Affected parties are defined as those who would have received a coordination notice under this recommendation had this been a proposed activation. In addition, the licensee shall update the database to reflect the commencement of operation or decommissioning of the link. As described in the Canadian Table of Frequency Allocations 9 kHz to 275 GHz (2014 Edition), the fixed service shares the bands 71-76 GHz and 81-86 GHz with other services. Notably, the band 76-86 GHz includes allocations to the radio astronomy service, where the provisions for its protection from harmful interference under international footnote 5.149 apply. As a result, licensees proposing to operate transmitters in the bands 71-76 GHz and 81-86 GHz within 60 and 105 km, respectively, of radio astronomy observatories,Footnote 5 are required to notify and coordinate as soon as possible (minimum of six weeks) prior to deploying a station. They must also ensure that harmful interference is not caused. Licensees may contact the Department's regional or district officeFootnote 6 to obtain the contact information of the applicable radio astronomy operators. As technical parameters of radio systems operating under other services in the bands 71-76 GHz and 81-86 GHz are not yet available or have not sufficiently matured, sharing criteria will be developed and incorporated into future revisions to this SRSP, as necessary. Licensees should be aware that the fixed‑satellite, mobile, mobile‑satellite, broadcast, broadcast‑satellite and radio astronomy services are allocated on a primary basis in various portions of the bands 71-76 GHz and 81-86 GHz. Usage of the bands 71-76 GHz and 81-86 GHz near the Canada‑United States border is subject to the provisions of Arrangement V.
Possible interference conflicts resulting from the operation of fixed systems and other services operating in the adjacent bands may occur, even though the technical specifications of this SRSP are met. The resolution of interference conflicts should be achieved through good faith discussions and mutual agreement between the affected parties. When conflicts between systems cannot be resolved, the Department shall be so advised, whereupon, following consultations with the parties concerned, the Department will determine the necessary modifications. More parameters can be provided for the coordination process if necessary. This figure provides a chart summarizing the channelling plan. This plan is fully described in section 4.1. Tables C1 and C2 summarize the technical requirements of this standard which are prescribed in accordance with specific selection of other technical parameters in the design of a radio system. * Referenced above ground level (AGL). ** The specific requirements related to the minimum coordination footprint are described in section 7.1 of this standard. For the purpose of this SRSP, "harmful interference" means interference which endangers the functioning of a radionavigation service or of other safety services, or seriously degrades, obstructs, or repeatedly interrupts a radiocommunication service operating in accordance with regulations and technical requirements enacted by Innovation, Science, and Economic Development Canada under the Radiocomunication Act . The antenna radiation pattern envelopes A and B of this standard are aligned with the Class 3 and Class 2 specifications prescribed by the European Telecommunications Standards Institute standard ETSI EN 302 217-4-2 (V1.5.1), Fixed Radio Systems; Characteristics and requirements for point‑to‑point equipment and antennas; Part 4-2: Antennas; Harmonized EN covering the essential requirements of article 3.2 of R&TTE Directive . Should an operator use sites of very high elevations (relative to local terrain) that could produce interference for receiving stations beyond the distances shown in figures 5 and 6, the operator shall coordinate with the affected licensee(s). The distances shown in figure 5 are based on a maximum e.i.r.p. of +55 dBW, a channel bandwidth of 250 MHz, a victim receiver antenna gain of 55 dBi, and a −30 dB factor in order to account for the effects of victim receiver antenna discrimination or correlation between signal fading along desired signal paths and interference signal paths. Furthermore, a propagation model based on an antenna elevation of 30 m relative to an even terrain profile is used. Calculations for determining distances for which interference is produced should include accepted engineering practices, and should take into account factors such as propagation loss, atmospheric loss, antenna directivity and curvature of the earth. Calculations shall be made in accordance with Technical Service Bulletin TSB-10F, Interference Criteria for Microwave Systems , available from the Telecommunications Industry Association (TIA), or other recognized coordination methodology and criteria. Canada has two radio astronomy observatories, the Dominion Radio Astrophysical Observatory, located near Penticton, British Columbia (Latitude 49° 19′ 12″ North, Longitude 119° 37′ 12″ West), and the Algonquin Radio Observatory, located in Algonquin Provincial Park in Ontario (Latitude 45° 57′ 20″ North, Longitude 078° 04′ 23″ West). A list of the Department's regional and district offices is provided in Radiocommunication Information Circular RIC-66, Addresses and Telephone Numbers of Regional and District Offices .